Tourism professionals gathered to celebrate the continued success of the Tennessee tourism industry by announcing the 2017 economic impact numbers recently at the Musician’s Hall of Fame and Museum. Gov. Haslam and Commissioner Triplett announced Tennessee tourism’s direct domestic and international travel expenditures reached a new all-time record high of $20.7 billion in 2017, up 6.3 percent over the previous year, as reported by the U.S. Travel Association. Tourism also generated 184,300 jobs for Tennesseans, a 3.1 percent growth year over year. For the 12th consecutive year, tourism topped $1 billion in state and local sales tax revenue, reaching $1.8 billion. That marks a 7.6 percent increase over 2016, higher than the national growth of travel-related state tax revenues of 4.6 percent. “Counties, cities and rural communities work hard to make our state a premier destination, welcoming visitors from around the world,” Haslam said. “Our state’s second biggest industry continues to see outstanding growth, break visitation records, boost Tennessee’s economy and create new jobs. The Tennessee Department of Tourist Development and Tennessee Tourism Committee continue to produce record results that fuel our state’s economy.” Locally, Lori Nunnery of the Jackson - Madison County Convention and Visitors Bureau / Visit Jackson, Tennessee serves on the committee. Madison county leads northwest and southwest Tennessee with over $209.14 Million in tourism expenditures, an increase of $6.32 Million over 2016. Tax Receipts are $12.67 Million for the state and $4.51 Million locally. Travel related payroll has increased by 3.9% to $44.42 Million. 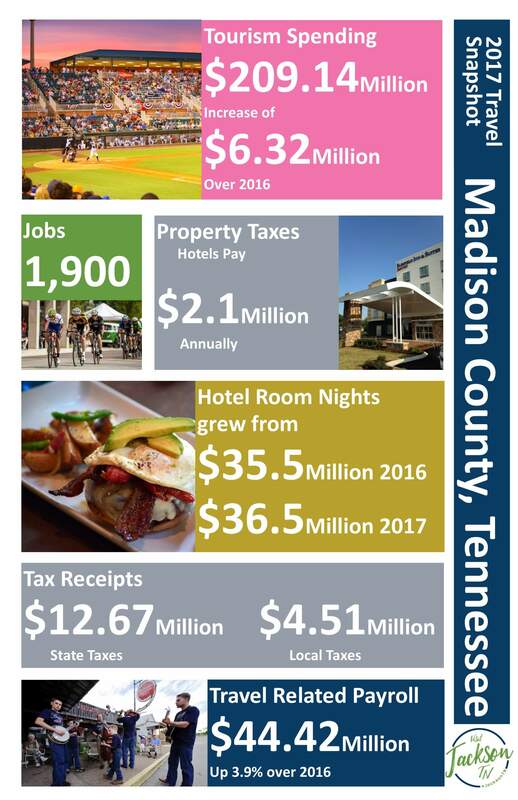 Over 1,900 people owe their jobs to tourism and hotels pay over $2.1 Million in property taxes annually in Madison County. For more information, contact Jill Kilgore, public relations media manager for the Tennessee Department of Tourist Development, at 615-927-1320 or by email at Jill.Kilgore@tn.gov. Locally contact Jackson - Madison County Convention and Visitors Bureau’s Lori Nunnery at 731.425.8333 or lnunnery@jacksontn.com.